Traveling cat spotted in front of the Spanish Steps in Rome, Italy. This famous stairway of 135 steps is the widest in Europe and links the Piazza Trinità dei Monti and the Piazza di Spagna. 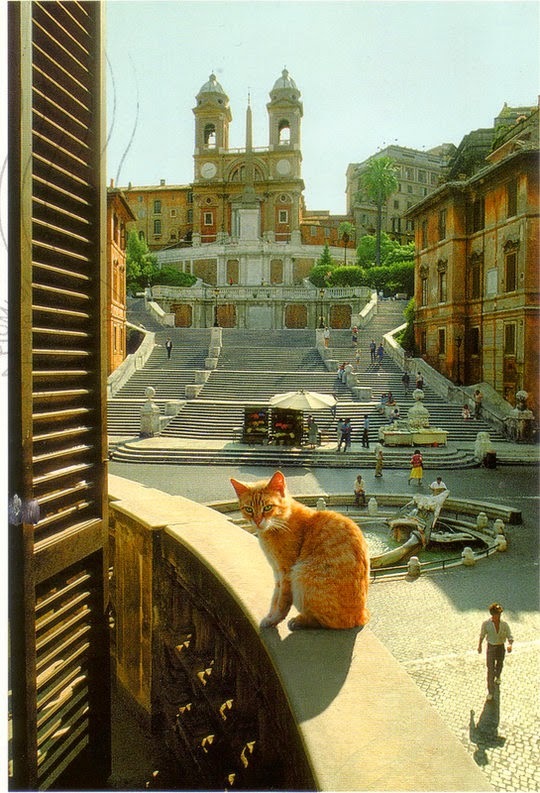 Cat picture by Giancarlo Gasponi, author of the photobooks Rome Revealed, Rome: Water and Stone, Portrait of Rome and Rome: Fascination of Art and History. Quelle belle photo ... monumentale ! Wow, that is an absolutely breath-taking picture. What a beautiful cat. It's funny how they probably don't appreciate all of the beauty and history that surrounds them. Wow! That looks like a beautiful place! Plus a gorgeous kitty! Win win! What a pretty place to hang out. 135 steps? Think of all the cats that could exercise and nap on them. Il a l'air bien sérieux ce rouquin. Sa couleur est en harmonie avec le décor ... la grâce féline. You have a nice background for you cat photo shoot! Great shot! So..cute photos of kitty's.Gorgeous colour.Thanks for share with us. Nice Place!Great Photo. kitty's look so nice.Thanks for sharing.